I spent well over a dozen hours in the Underdark this Thanksgiving weekend, and was extremely pleased with what I saw. The expansion brings a unique adventure to Neverwinter Nights, complete with a slew of additions, including new epic levels, prestige classes (the Shifter, Weapon Master, Red Dragon Disciple, Dwarven Defender, Champion of Torm, and Pale Master), spells (including four epic spells - Dragon Knight, Greater Ruin, Hellball, and Mummy Dust), feats (including a variety of epic feats), skills, and equipment. The story begins with the disappearance of Halaster, the powerful archmage that constructed Undermountain, a place D&D veterans will recognize as a chaotic network of underground tunnels filled with fantastic treasures and the deadliest of traps. With Halaster no longer in charge of Undermountain, the creatures that inhabit it are free to wander as they please and the Drow from the Underdark below have taken the opportunity to begin a massive attack on the city of Waterdeep. The adventure starts off with your character arriving in Waterdeep at the Yawning Portal, a cozy inn nestled atop the primary entrance to Undermountain. You begin at 15th level, and are given the option to either level your character manually and pick the collective attribute bonuses, feats, spells, and skills or allow the game to do so automatically. This gets you to a good start for the sinister dangers that await you below, and allows you to experience epic levels not far into the game. Without giving away too much, let me just say that you'll be plunged headlong into the foray of Undermountain shortly after beginning the game. Your primary objective is to discover the cause of the Drow attacks and come up with a solution to stop them, but it isn't as simple as it sounds. First, you must find out what has happened to Halaster in order to restore some sort of order to Undermountain. Secondly, four of your previous Neverwinter companions have gotten themselves killed throughout the tunnels and you're somewhat obligated to find a means of resurrecting them, especially if you're in need of a henchman. Thirdly, it appears that a particular female and her summoned fiend are responsible for the Drow that are parading through Waterdeep, so ending their lives seems like a good solution for the problem at hand. To accomplish any of these goals, however, you must first make it past some of the toughest puzzles, traps, and enemies seen in Neverwinter Nights yet. It is by no means an easy task. BioWare has put quite an arsenal of new features and equipment at your disposal, though, which makes your journey a little bit easier. Most of these additions are geared for the higher levels, since your character won't be starting out from scratch. Take the feat Blinding Speed, for instance, which allows you to cast Haste on yourself once a day. A powerful ability, but only available to those characters with a Dexterity of at least 25. Additionally, for those of you who played Shadows of Undrentide, you'll recall that magical equipment was increased to a maximum of +5 enchantment. Hordes of the Underdark brings the maximum enchantment all the way up to +7 and adds a whole variety of interesting and unique weapons and armor. For example, while searching through some skeletal remains, I happened upon an intelligent longsword that had its own personality and dialogue (on top of its very powerful statistics). Although a talking sword may not sound like much, it adds flavor and a definite fun factor to the already impressive expansion. If you thought your level 20 character was powerful, wait until you experience yet another 20 epic levels. This whole new stage of leveling grants you access to feats that can greatly increase your attributes, provide you with spell resistance or damage reduction, make your melee attacks far more destructive, or even allow you to transform into a dragon. This is easily my favorite addition with the expansion, as it provides a whole new reason to play through the original modules again in order to see the devastating power each class can attain. 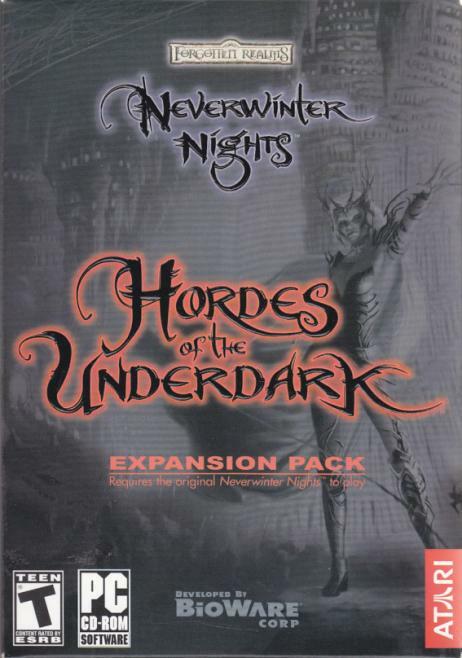 Hordes of the Underdark is the definition of a great expansion, bringing not only another elaborate adventure to the game, but also a huge assortment of epic levels, feats, spells, and equipment that make Neverwinter Nights the truest and most in-depth Dungeons & Dragons experience to date. I would not only recommend this expansion to fans of the original game, but also to anyone interested in taking a firsthand voyage through the Drow homelands. Hordes of the Underdark ships tomorrow - and Lloth beckons.